Home > Blog > Gardening > Annuals > This ever happen to you? I don’t know why but right now I’ve lost a bit of interest in my garden and am a little disappointed. Nothing fun is going on in it, there are visible and invisible things and creatures destroying plants and the sun has done a fair amount of damage whilst I wasn’t paying attention. Growth has been great all round, unfortunately too great in some areas. Once again my lavender plants have become unruly (do they want baby-sitting all the time?) and something has started to destroy my Impatiens, one plant at a time. I’ve lost three in the last week. Most of the time in the garden is spent cutting back and pulling out the now thuggy Lamium or dead-heading spent roses and Dianthus. The supporting stakes of two of my standards snapped and needed emergency rescuing. My Agapanthus have been attacked by a worm of sorts and I’ve lost a Carex and two Acorus to something … See? It’s all not a whole bunch of fun right now. Lots of casualties but no “wow” moments and no fabulous flower shows. My question is to experienced gardeners – is this normal that I feel this way? Do all gardeners get fed up with their gardens for a while and get over it? I’m hoping this is an annual malady and that I’ll snap out of it really soon. And after they have been attacked. Snapped off at soil level. I wouldn’t be as upset about the Impatiens if they at least ate the whole plant. But they don’t. They just bite them at the stems, they break off and then die. (Who “THEY” are, I do not know. Yet). It’s time to share our highlights and disappointments of the month. I’m joining Bumble Lush and friends in “best of” and “worst of” the garden in January. By the way, if you want to get involved in the gardening blog community, consider joining a blog meme. See our list at Gardening Blog Memes. Slugs are eating them and beer in jars helps as slugs like yeast and end up drowning in the beer but the key is to have indigenous impatience. 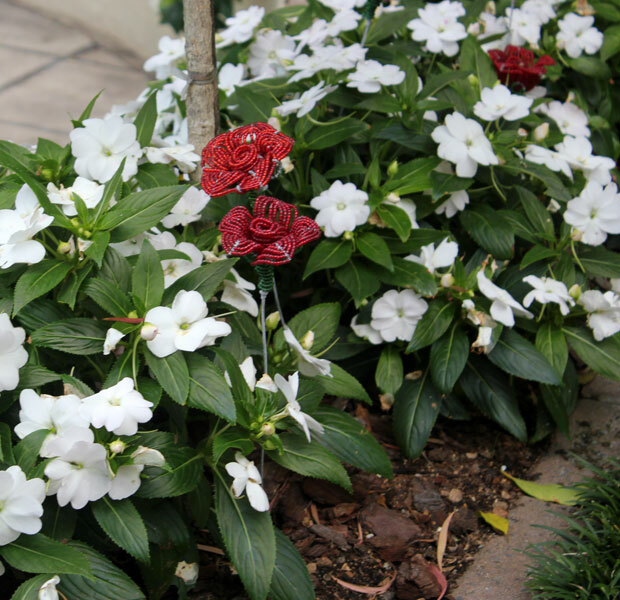 oh my goodness–SO sorry to read about your impatiens! I wonder who the culprit is? I think it’s normal to have periods of low interest in the garden (or in any activity). There was a time last summer when I just didn’t feel like going out and watering the plants and checking for ripe veggies. Maybe it was the heat! Thanks for linking up with my meme, and I hope this mystery impatiens gobbler doesn’t get any of your other plants! I get discouraged during July and August every year, when my efforts produce pitiful results and the weeds and nasty bugs seem to be winning. I try to be philosophical about plant losses, but the year something ate through the roots of a little Japanese maple my mother gave me shortly before she died, and it perished overnight…that was disheartening! But gardens are all about hope; there’s always a new plant, another year, another season. I thought of cutworms for your impatiens too. I remember when I first started gardening I felt every set back too and was disheartened by it. But as time went on and more plants died, more insects attacked, the deer became more numerous, we had a winter that went below our hardiness low, we had many summers with no rain and 95 degree heat for months, I got used to it. Unlike many people in the world, we can control so many things in our lives—our food and water supply, to a much greater extent than ever before our health, the education of our children—but gardening is an area of our lives where things happen that we can’t control, and it takes some getting used to. Failure is part of the process. It helps that I get to leave for a while in the summer and go to my island in Maine where I don’t garden. I hope that didn’t sound too preachey. Do you think the culprit could be a cutworm? Do you have them where you are? Ha ha, I think it happens to all of us. It happened to me almost all of last summer when there was hardly any rain and I wondered why I bothered to start a gardening blog because there was nothing to post about. But then the monsoon rains came and I had a few flowers to enjoy before the garden went to sleep in the fall. Hi my friend! Yea, it is too hot some days and I also just don’t feel like it! There is tooo much needing attention and plants going to seed and others not handling the summer heat. The only heavy-duty work I want to do is water the garden and pick tomatoes and figs. And as for the Impatiens!! That is soul destroying!!! What could be doing this?? Cheer up! Alan has a great suggestion!! Christine, I think that every gardener feels as you do at some point during the season, no matter which climate they live in. Sometimes we just get bored and need a little break or a distraction. How about this one? I always enjoy your writing and have, therefore, nominated you and your Blog for The Versatile Blogger Award. The Award is for both you and Barbie, awarded here since yours is the latest writing. Both of you should feel free to post the VBA Badge on your pages if you wish. Yes, I’m curious, too. And yes, I do get the doldrums periodically. That’s when I think I need to just go SIT out there and enjoy it!! Last Spring we nearly flooded away and all Summer was drought (I mean it!). It was not a fun gardening time. However, should it happen again, I’m ready! I’m not going to pout. I’m going out there with my shovel, my wheelbarrow and I’m doing some serious landscaping work!! Every single year I go through a stage of this, garden ennui. Its just part of the cycle and mine tends to come late summer as well, when its a fight to keep anything alive out in the sun as well as heart attack inducing to be working out there. I swear, I think anticipatory gardening (just Spring enough to attempt to plant things even though you shouldn’t!) is more exciting and fun than when the garden is at its peak. Human nature. Yes, I feel like that every year, usually in late autumn, when the garden seems to run out of energy, and so do I. It comes at time when you look back on the gardening year, and for some reason only see the failures. But the good news is it soon wears off, trust me, it does. Oh, sweet gardener you are so NOT alone! As soon as you get a little break in the weather and the light hits a plant that certain beautiful way, you’ll get your mojo back. 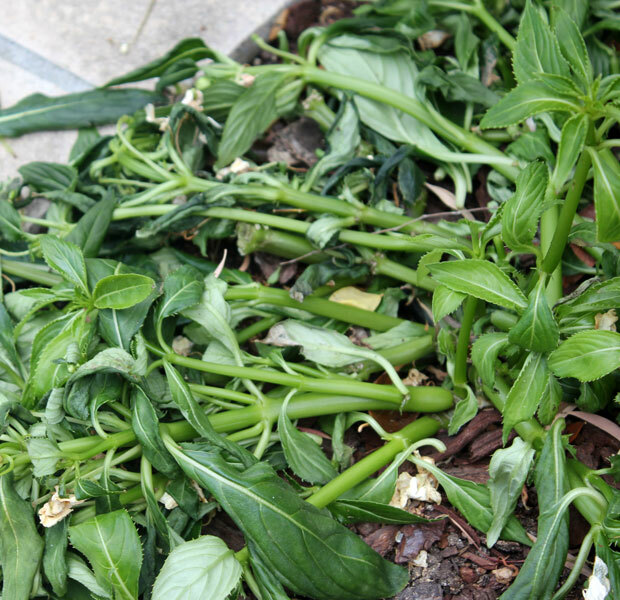 Sorry about your impatiens…hope you find the culprit soon. Our mediterranean summer makes me envy northern gardeners, who take time out, sit by the fire and plan for the next growing season, pore over catalogues, make sketches. I think we need to do the bare minimum. Have been diligently watering my roses Every 5 Days and they are full of buds and new leaves. Fed them this morning too. For the rest, a little tidying on overcast days, and wait for autumn March coolth rain! I’m working on a mindset that accepts brown and gold leaves and grey clay as high summer colours. Will be spreading spekboom cuttings this autumn. That manages to look lush and green NOW!! So glad others feel this way — I’m not alone! I spent the past year working tirelessly in my garden. I was a newbie gardener and really had no idea what I was doing at first, learning along the way. Spent loads of money on plants and soil, compost, fertiliser, etc, and then didn’t like the way it looked! Or the plants died. Or they reached the end of their season. My beautiful geraniums have all died. I think I over-watered them. My lush mint has been completely eaten by something, although I don’t really mind if it’s a caterpillar and will turn into a butterfly. I have spinach in my veg patch that I call the sacrificial plants — all holey and eaten by something. My portulacas were nibbled away by snails, although they are the only thing I will kill in my garden (squashed by my shoe). I leave everything else to the birds, and I am so excited to see the same LBJs in my garden every day (for the past month I think), tweeting with every flight or hop they take. Am hoping they’re feasting on the insects. My garden sometimes brings me so much joy. But many times it makes me so anxious just to look at it, all that hard work and nothing to show. I often feel these feelings are all so wrong — isn’t gardening supposed to be relaxing and rejuvenating??!! But there are times when it is all worth it. My bouganvillea was magnificent in Spring, and then came the early Southeaster in November and it all blew away. But the colour is back again, and I’m loving the effect over our courtyard. But the Southeaster is also back, and every day we have piles of pink on the pavers. Hoping we’ll have some joy for a few more days at least! And when I sit out on our patio with the daisies in full bloom and the lime tree flourishing in the good soil and sun, then I feel good. But then this morning, my butternut babies looked like they had all turned squishy. No idea why. The seed sprouted from the compost the plant is running wild. But any fruit from it I wonder? Gardening feels all up and down, up and down! I think it’s pretty normal to get disheartened when things are going wrong – in gardening or otherwise! I regularly fight of hordes of creeping, sucking things which like to slowly sip their way through the health of my plants. Still, there’s a sense of satisfaction in finding a bug and wiping it out. And even more in curing a plague! Keeping a watchful eye out for pests brings you closer (often literally so, sometimes with magnification!) to your plants, and that’s never a bad thing. Good luck in finding the culprits – things that snack at that level are probably some sort of beetle grub or the like (cutworms); dig up the soil around there and see if there aren’t any beasts lurking in the soil. Some pitfall traps might also be handy in case it’s a wandering culprit. Also pitfall traps are usually great ways of finding interesting insects! Oh i am sorry about that, but it really is so disappointing and disgusting! It happened to me many times especially because i visit home only weekends or every other week. Sometime a kid (goat’s baby) come in and eat the leaves, mostly they are the chicken which eat the leaves of anything. And they also scratch the ground. Sometime the cats played on them not knowing they are damaging the plants. I tell you something, when i was in high school i throw a stone to shoo the rooster away from my newly planted rose, and it accidentally hit the head. It was a big lovely rooster, and it spin around, and then lay dead. I was so sorry, but it happened! My mother buried it. I don’t know what’s destroying your impatiens, but what you’re feeling is very normal. I think we all have high hopes going into spring, spring comes and it’s great, then summer hits. It’s hot, the garden is not exactly how we envisioned it, things go wrong, and we get a little discouraged. This feeling will pass. And you will start making plans for next year’s garden to be even better. And the cycle continues – I guess for as long as we can garden! Oh, that is a sad sight. 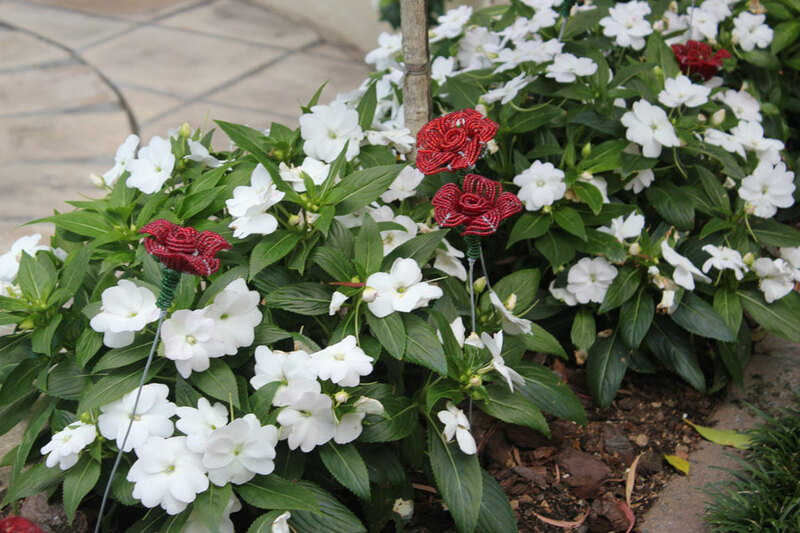 I like the red crafted flowers, they look pretty in with your former impatiens. No, you’re the only one who feels this way. What’s wrong with you? Of course I’m joking. Although I’d be determined to figure out what was whacking my plants, there comes a time (usually in the hottest part of the summer) when I just don’t really care. Deadheading? Harvesting edibles? I’ll do some watering if needed, but I just can’t get into it. Just take some time off (or see if you can get somebody to help out a bit), and once it cools off a little you’ll be energized and ready to go again. Or maybe you just need to go with Barbie on another plant shopping trip?